Cityparks rangers ensure everyone enjoys our public open spaces safely. The rangers work alongside volunteers, local preservation and horticultural groups to maintain our parks and countryside. What do the park rangers do? Work closely with Cityparks gardeners to help keep a close watch over all the public open spaces in our city. Encourage appropriate behaviour, mutual co-operation and consideration from all groups using parks and, if necessary, take enforcement action. Patrol playgrounds, recreation areas and paths, including footpaths and cycle tracks. Provide a reassuring uniformed presence in our parks to encourage a sense of security and to provide information. Education and interpretation, including events. Habitat protection, including practical conservation tasks and surveys. 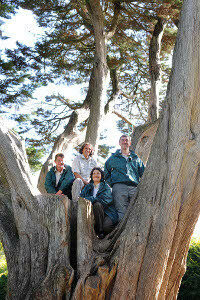 Involve local community groups, particularly in active conservation of our parks. If you see a park ranger in your local park or open space, please go and say hello!